Delivery Days: Tuesday is the delivery and pick up day for Willits members and Thursday is the delivery and pick up for Ukiah members. Season: The season runs from the first week in May until Thanksgiving week. We hope people can join us for the entire season, but if there is space signups are accepted throughout the season. Share Size: The garden share is based on a half bushel basket feeding a family of 2 to 3 people depending on diet and eating habits. If a larger quantity is needed, additional garden shares can be ordered. The vegetable share will provide a seasonal variety of produce each week from the beginning of May ending Thanksgiving week. 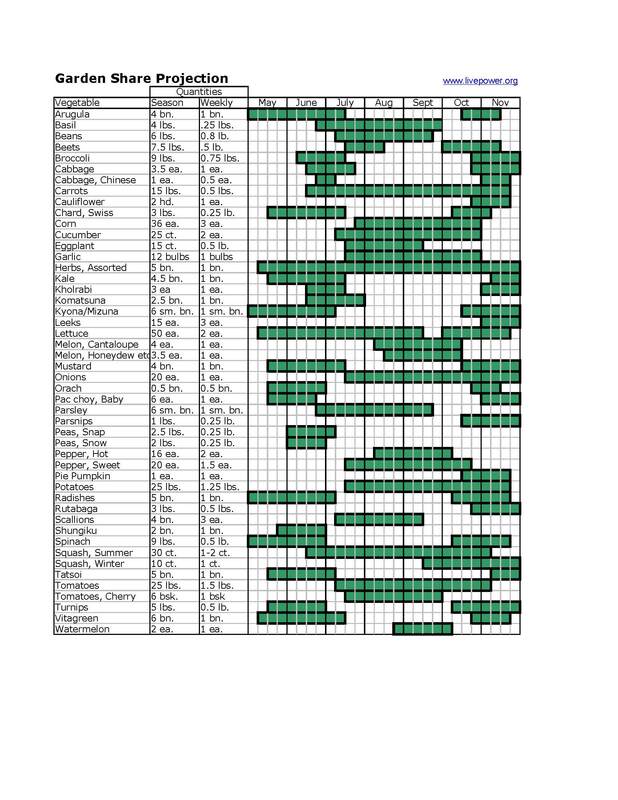 Below is a table showing the schedule and quantities planned for the garden share. Please click on PDF to download. Of course, each season is different. For example here are the Garden Share harvest totals for 2012 and 2013 (click on year to see totals). The farmers will harvest what is ready at each season. Early spring baskets are usually smaller with mostly greens and early roots, then peas and broccoli, then increasing in quantity and variety with corn, squash, tomatoes, melons, potatoes, roots and greens as peak summer harvest is reached in August and September. Fall harvests are also bountiful with roots, storage crops, cabbage, broccoli, cauliflower, leeks and greens. The baskets will increase in quantity and variety as the weather warms and more types of vegetables are ripe. Blueberry Share from Filigreen Farm. Biodynamic blueberries come from Filigreen in Boonville. The share consists of 3 baskets of 6 ounces each for 4 deliveries starting the end of June or beginning of July depending on the seasonal weather and costs $45. Members can order more than 1 share, or can consider splitting a share with a friend or neighbor. The delivery dates may shift due to ripening conditions, but we’re confident that there will be 4 deliveries. Fruit Share from Filigreen Farm. Filigreen Farm will periodically offer bulk fruit with the possibilities including Demeter certified biodynamic peaches, apples, pluots, plums, and table grapes for the months of August, September, October and November. Also available from Filigreen Farm is Demeter certified biodynamic olive oil. Monday is harvest day for Covelo. Tuesday is harvest day for Willits members. Willits: The van will arrive at 429 Redwood Ave in Willits at 4:00 pm. Those folks who want to help sort the baskets can come then to help or come after 4:30 pm and your basket will be ready to be picked up. Thursday is delivery day for Ukiah. Ukiah: The van will arrive at 1101 W. Clay St. at 5:00 pm. If you want to help unload the van and help set up for sorting the vegetables, please arrive at that time. After 5:00 pm the vegetables will be on the tables ready for all to sort. If you are unable to sort your own, please come after 6 pm and the baskets should be ready. 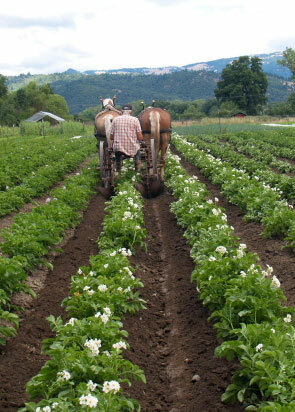 Baskets: Willits and Ukiah members will purchase 2 baskets from the farm at $8 each which will be used alternate weeks to hold their produce. Each basket will have the member’s name on it. The vegetables will be sorted into wet burlap in these baskets. It is important to return the baskets and burlaps each week before or as the vegetables are being delivered, so the baskets are there to fill when the van arrives. If there is no basket before the end of the sort, the produce will be in a paper bag. Missed Pickups: If there is a week when you will be unable to pick up your produce at the scheduled time, please contact Gloria (livepower@livepower.org or 707-983-8196) to make other arrangements. Any produce that is not picked up by Tuesday night for Covelo members, Wednesday night for Willits members, and Friday night for Ukiah members without notice given will be passed on to someone in need. Please respect the folks who are offering their places for delivery and pick up your produce as soon as possible. If someone else is going to pick up your vegetables, please let me know who they are and their contact information and be sure they thoroughly understand the directions and timing. Thanks. If you are interested in joining, please complete our online request form. If you are interested in splitting a share and do not have a partner in mind, please indicate that in your email request form. Sometimes (but not always) we can match you with another household in your area. We would love to have you join the farm! If you are interested, please complete the online request form or contact Gloria Decater at livepower@livepower.org or 707-983-8196. If you know of someone else who might be interested, please let us know. As the energy crisis and climate pollution deepens and the need becomes more acute to get local food production and a local food system up and running, we need to know about new ways of creating and operating farms. The 100% community based farm (CBF) represents a completely new way to organize food production in contrast to the market based agricultural system that we have now which often does not take very good care of the farmer, the land, the climate, or the eaters. When a group of eaters/consumers come together and pool money to support the operating budget of a particular, local, diversified farm, and then share in eating the food that is produced, a stable economic basis is achieved which often cannot be achieved through the market system. In effect, the community of people eating from the farm are not buying food, but rather partnering with the farmer in creating and operating the farm. There are many roles they can play – from simply providing a share of the budget and eating the food to serving on an advisory board to define the farm crop plan, the farming and energy practices, address land and capital issues, and facilitate communication through a newsletter, website, and member outreach and farm celebrations. Through this involvement, people can play a conscious and active role in forming and manifesting a new food system.